SMi Reports: Superbugs and Superdrugs 2018 returns to Central London next spring to push industry collaboration through updates on clinical advancements and investment opportunities. 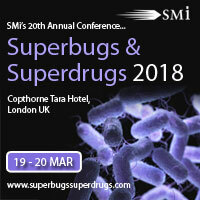 SMi Group has released an agenda for the 20th annual Superbugs & Superdrugs conference returning to Central London on 19th and 20th March 2018. Welcoming expertise from some of the most senior industry thought leaders in infectious disease and medical research such as the MHRA, GARDP (DNDi), Nemesis Bioscience, Gladius Pharmaceuticals and Chemical Biology, SMi’s flagship conference in the global Superbugs & Superdrugs series will once again provide a platform to tackle antibiotic resistance by addressing scientific, regulatory and economic challenges in drug discovery. For those looking to register, there is currently a £400 early bird saving available online which expires on 30th November 2017. Superbugs & Superdrugs 2018 takes place on 19th & 20th March at the Copthorne Tara Hotel, Kensington in London, UK.